Light weight comfortable design, fits snugly without strain. Hear conversations at the shooting range, and hear game stirring while hunting, all while protecting your hearing. Convienient neck strap allows easy carrying for when firing line is not hot. On/off switch and volume control. Over 200 hours battery life; uses two AA (not included). Also great for the factory floor, construction, or other loud noises. Soft ear cushions give all day comfort. 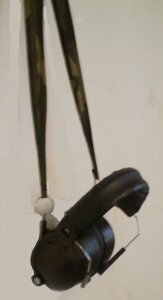 Padded headband with side wire guides keep the ear cups safely in place.